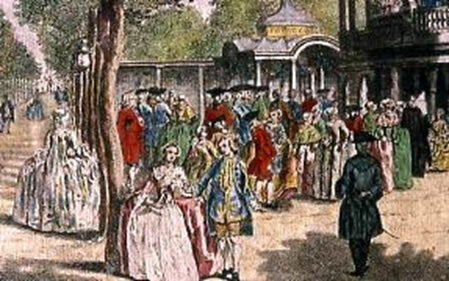 Vauxhall Gardens stood on the south side of the Thames, a short distance east of Vauxhall Bridge, and from the reign of Charles II proved a popular public meeting place. The Gardens, originally called New Spring Gardens, were laid out around 1661. Admission was free but, until Westminster Bridge was opened in 1750, they could only be reached by water via a sixpenny boat ride. At this stage, the Gardens were modest. There were walks, flowerbeds and arbours, but the refreshments were basic and what entertainments there were came from freelance performers or the visitors themselves. The main attraction of the Gardens was that young men and women could meet together, mostly free from the constraints of polite society. Unfortunately this informality made them an ideal place of business for the prostitutes of London. When Sir Roger de Coverley in 1712 had his moonlight musings rudely interrupted by a masked woman, who asked him to join her in a bottle of mead, he lamented that the Gardens needed more nightingales and fewer strumpets. Over two centuries Vauxhall had a succession of owners and managers, the most famous of whom was a remarkable young entrepreneur called Jonathan Tyers. From the moment he assumed its management, Vauxhall Gardens was transformed. Tyers extended and remodelled them into a fashionable venue where customers could hear the best music and view the best artworks. A grand opening took place on 7 June, 1732, in the presence of Frederick, Prince of Wales, and from then on the clientèle regularly included royal dukes, aristocrats and wealthy landowners and merchants. Yet one of the great attractions of the Gardens was that anybody who could afford the eventual one shilling admission could mix on an equal footing. A typical evening would see visitors cross the river and arrive at the Vauxhall Stairs. From there, they walked the last few yards to the entrance of the Gardens. The first thing they saw when they entered the central area was the great marble statue of the composer Handel, commissioned by Tyers and executed by Louis François Roubiliac. As well as the popular tunes and songs of the day, Handel’s music was often played by the band striking up in the Orchestra building. Tyers also commissioned Hogarth to paint pictures for several of the different rooms. By the mid eighteenth century, he had added statues, arches and a cascade. Also installed were a music room, a Chinese Pavilion and a new Gothic orchestra boasting fifty musicians. An unnamed Irish gentleman visiting the Gardens in 1752, wrote: The garden strikes the eye prodigiously; it is set with many rows of tall trees, kept in excellent order, among which are placed an incredible number of globe lamps, by which it is illuminated, and when they are lighted the sound of the music ravishing the ear, added to the great resort of company so well dressed and walking about, would almost make one believe he was in the Elysian fields. 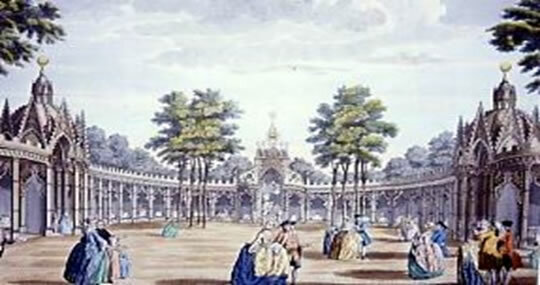 Two semi-circular ‘piazzas’ were opened in the middle of the Gardens with supper boxes or booths, each seating between six and eight persons, and decorated with paintings. The Vauxhall supper usually took place as dusk fell and the most famous item on the menu was the legendary Vauxhall ham, cut so thin that you could read a newspaper through it. Besides cold meats, salad, and cheese, there were custards, tarts, cheesecakes and other puddings. The food was costly: in 1817 a small dish of ham and two tiny chickens cost eleven shillings. Assorted tarts and custards were another four. The wines, however, were of the very best. The Gardens were also known for their arrack punch, a heady liquor made from mixing arrack, rum and sugar. One of the great special effects of Vauxhall was enacted during supper. As night fell a whistle was blown as a signal to a number of servants placed in strategic parts of the garden. Each servant touched a match to pre-installed fuses and, ‘in an instant’, a thousand globe lamps were illuminated, bathing the entire Gardens in a warm light that was visible for miles around. 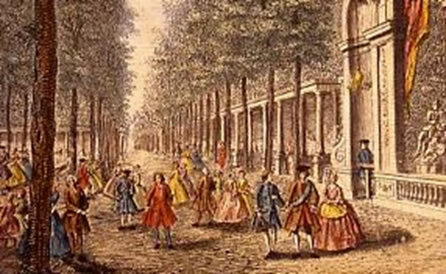 Following the death of Jonathan Tyers in 1767, Vauxhall was run by his children, grandchildren and great-grandchildren and by the time of the Regency, the Gardens were well and truly established as a venue for pleasure and a setting for spectacular events and unusual entertainments such as acrobatics, equestrian feats and balloon ascents. A grand fête was held on 20 June, 1813, to celebrate Wellington’s victory at Vittoria during the Peninsular War. As the nineteenth century progressed, however, the gardens began a downhill progress. The proprietors blamed magistrates for continually banning their most popular attractions as too dangerous or disruptive to the newly-respectable neighbourhood of Kennington. But there was more to it than that. Vauxhall Gardens had become old-fashioned. The railway now ran past its main entrance, making travel further afield easier and cheaper. And the Gardens had become run down and tawdry: trees remained unpruned, gravel unraked and many of the globe lamps fell into disrepair. Attractions became shabbier and mellow punch gave way to fiery brandy. The company, too, became increasingly less respectable and the popularity of the Gardens dwindled. A very good reason, perhaps, why Lucas Royde in House of Glass chooses it as a place to meet his married lover. 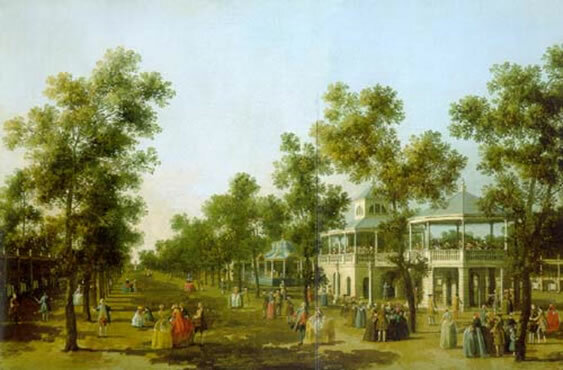 On 25 July, 1859, the Vauxhall Gardens opened for the ‘Last Night for Ever’. The site was later sold to developers and divided into three hundred building plots. It seemed that Vauxhall Gardens was destined to disappear for ever. But the twentieth century brought the Blitz to Vauxhall and, after the war, part of the site was cleared to become once more a park for the city’s inhabitants. It was named Spring Gardens.